Three winners have been named in the 2016 SPIE Startup Challenge after a live competition during SPIE Photonics West in San Francisco. Top prize in the contest hosted by SPIE, the international society for optics and photonics, and supported by Founding Partner Jenoptik and other sponsors went to Colorado-based Double Helix. Founding Sponsor Jenoptik representative Jay Kumler, center, congratulates Double Helix on their first-place win in the 2016 SPIE Startup Challenge. First-place winner Double Helix won with its 3D system that can image at the single-molecule level inside individual cells. 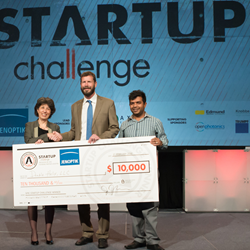 A 3D nanoscale imaging system, a marijuana breathalyzer, and a disease diagnostic tool made with refrigerator magnets and a laser pointer were selected as the top projects in the 2016 SPIE Startup Challenge. Hosted by SPIE, the international society for optics and photonics, the pitch competition was held 17 February in San Francisco during SPIE Photonics West, the premier annual event for the international optics and photonics community. Along with the winners, other finalists were: Bold Biometrix with its blood-pressure monitoring patches; Bodle Technologies, for its reflective displays for wearables; and Stream Technologies’ spectral camera lens.